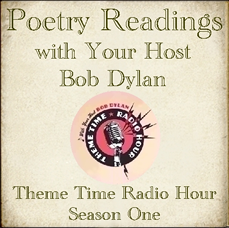 The aptly named stewART, well-known in the fan community for his CD art for Dylan concert and TTRH recordings, was nice enough to contact me - and then alliteratively patiently put up with my procrastination - and volunteer to create cover art for the Poetry Readings from Season 1 of Theme Time Radio Hour episode for those wanting to keep it on CD in a good-looking package. And here it is: Front, Back, and gate-fold insert with track listing. You can click on the images to your left to reach, and then download, the full-size versions. Thank you, Stewart! As I've mentioned, probably ad nauseum by now, that episode has been by far Dreamtime's most popular show to date; a somewhat chastening experience, as with the exception of the 14 Views from the Big City show, it also had the least original content to date. I'm not foolish - or egotistical - enough not to recognize that the majority of people come to Dreamtime for Bob Dylan rather than Fred Bals content. 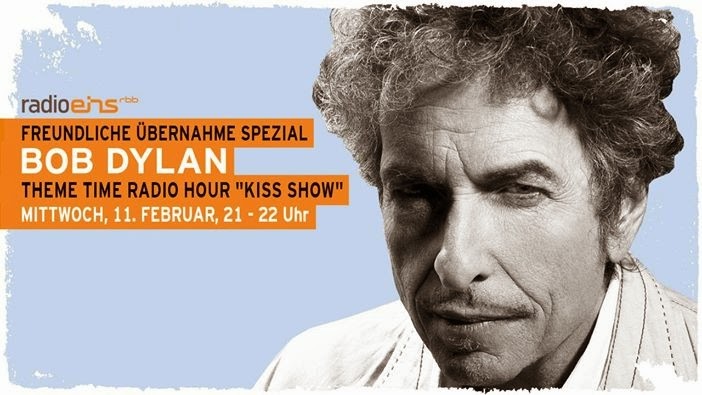 But, as I said when I started Dreamtime way back in 2006, I'm doing the podcast and blog not to ride on Bob Dylan's popularity, but because I'm intrigued by the stories behind the music and artists Mr. D. features on TTRH. When I think I do a Dreamtime show right, it's "a backstage pass to Studio B." as one of my listeners eloquently put it. When I sit here and moon about such things as Fair Use and Ethics, which I do more than you might imagine, I comfort myself with the thought - or delusion - that I've added value to the Theme Time Radio Hour experience. So, while I much appreciate the response to the poetry show, I hope you understand that I treasure more the email and audience I have for shows such as my encounter with the ghost of James Dean; how Phil Silvers came to write "Nancy with the Laughing Face"; or on the legend of Stagger Lee. And if Our Host, Eddie G., or someone else from the TTRH team stumble across Dreamtime at some point, I hope that they'll recognize shows such as those - in fact, most of the Dreamtime shows - better represent what I'm trying to do. And to wind up, if you haven't already, remember to enter our Dreamtime Constant Listener contest, underway right now. 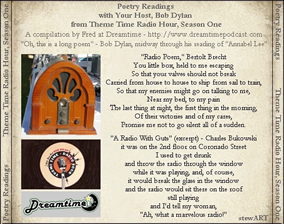 Send us an email with your guess on the date that Theme Time Radio Hour returns with Season 3, and get the opportunity to win a copy of Million Dollar Bash, as well as a CD of Poetry Readings direct from the Dreamtime studio with these nifty stewART covers. The contest ends with the official XM Radio announcement of Season 3, and full details can be found towards the end of the show notes for Episode 53 - Will There Be Any Yodeling in Heaven?